At the old man’s funeral, we get our first foreshadowing of the beast as the preacher intones from the Book of Job, verse 40. “Behold now the behemoth which I made with thee. He moveth his tail like a cedar. Out of his mouth go burning lamps. And sparks of fire leap out from the behemoth. He maketh the oceans boil like a pot. His breath kindleth coals and a flame goeth out of his mouth.” I suspect that some theologians may quibble with this exact wording of Job. Mayhem and typical B-grade movie dialogue ensues. Finally, late in the movie, after our deadly pal has fried a dog, a boy, and his dad, we get to meet a paleontologist, who can educate us on what exactly we will see when the director reveals THE BEHEMOTH. 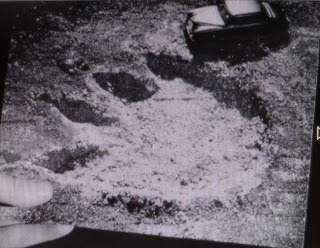 Samson hypothesizes that the track maker was 150 to 200 feet long. He then launches into an explanation that would make a non-cinematic paleontologist shudder. 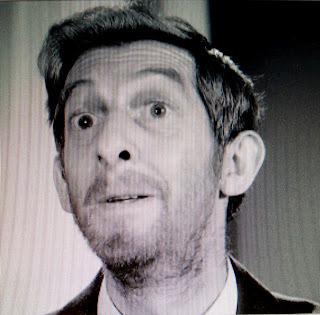 “Oh, it’s headed for the Thames, they always make for the freshwater rivers to die. That’s where the skeletons have been found. Some irresistible instinct to die in the shallows where they were given birth. You know, all my life I hoped this would happen. Ever since childhood I’ve expected it. I knew these creatures were alive somewhere but I had no proof, no scientific proof. And I had to keep it to myself or my colleagues would have all laughed at me. See no form of life ceases abruptly, and all these reports of sea serpents but what can they be but the tall graceful neck of Paleosaurus. He can stay underneath the surface for an age. And now he comes to the top. In another unrealistic portrayal of a paleontologist, we next see Samson in a helicopter stalking Behemoth. Or is Behemoth stalking Samson? Unfortunately for Samson, he and his fellow passengers succumb to the mystical sounding, pulsating lights, and the helicopter explodes in a blaze of paleontologists. 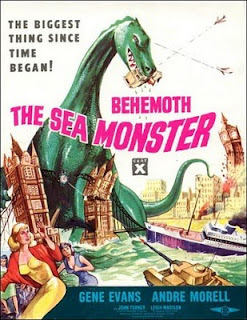 After dispensing Samson, Behemoth heads up the Thames, flips over a ferry boat, and climbs out of the river onto the streets of London to wreak havoc among the panicked citizens. Once on land, Behemoth reveals his true nature as some sort of sauropod, with the classic Apatosaurus body. Apparently satisfied with ripping out a few electrical towers, crushing cars, and disrupting the local architecture, Behemoth heads back to sea where he ultimately meets his end when Dr. Karnes blasts him with a radium tipped, submarine-fired torpedo. Ah, they don’t make movies like that anymore.